Content Library was introduced in vSphere 6.0 as a way to centrally store and manage VM templates, ISOs, and even scripts. Content Library operates with a Publisher/Subscriber model where multiple vCenter Servers can subscribe to another vCenter Server’s published Content Library so that the data stored within that Content Library is replicated across for local usage. 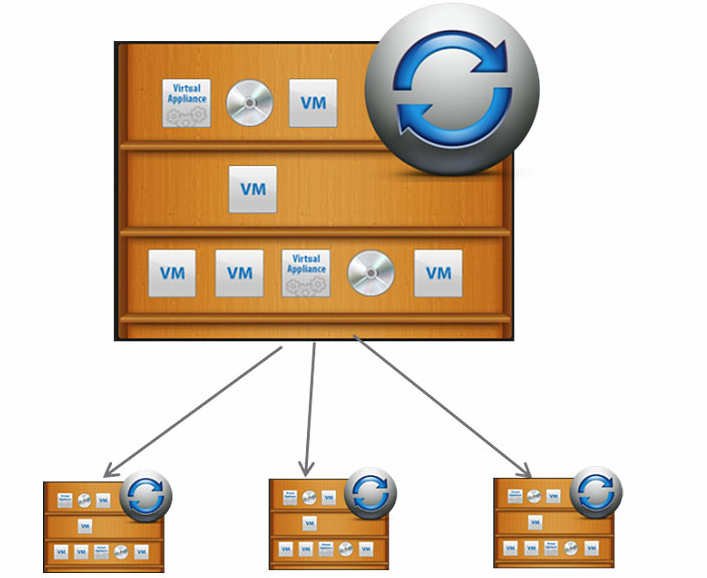 For example, if there are two data centers each with their own vCenter Server a customer could create a Content Library to store their VM templates, ISOs, and scripts in and then the vCenter Server in the other data center could subscribe and have all of those items replicated to a local datastore or even NAS storage. Any changes made to the files in data center 1 would be replicated down to data center 2. 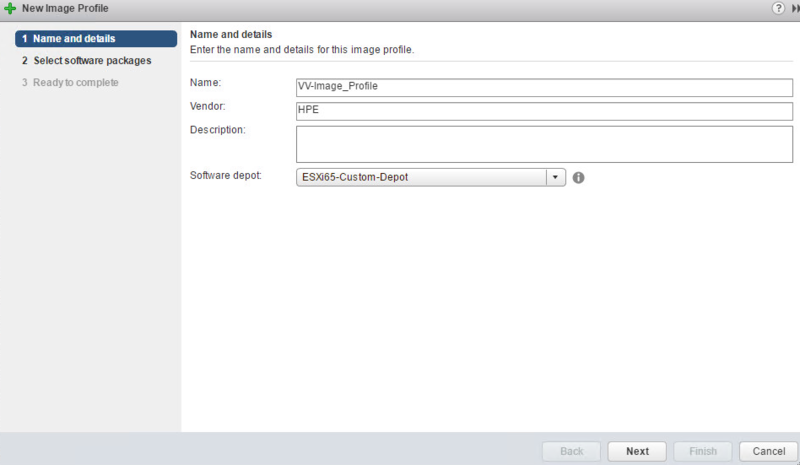 With vSphere 6.5 VMware has added the ability to mount an ISO directly from the Content Library versus having to copy it out to a local datastore prior to mounting. Customers also now have the ability to run VM customizations against a VM during deployment from a VM template within a Content Library. Previously, customers need to pull the template out of CL if a customization was required. Customers can now easily import an updated version of a template as opposed to replacing templates which could disrupt automated processes. There are now additional optimizations related to the synchronization between vCenter Servers reducing the bandwidth and time required for synchronization to complete. Customers can also take comfort in knowing that their Content Libraries are also included in the new file-based backup and recovery functionality as well as handled by vCenter HA. 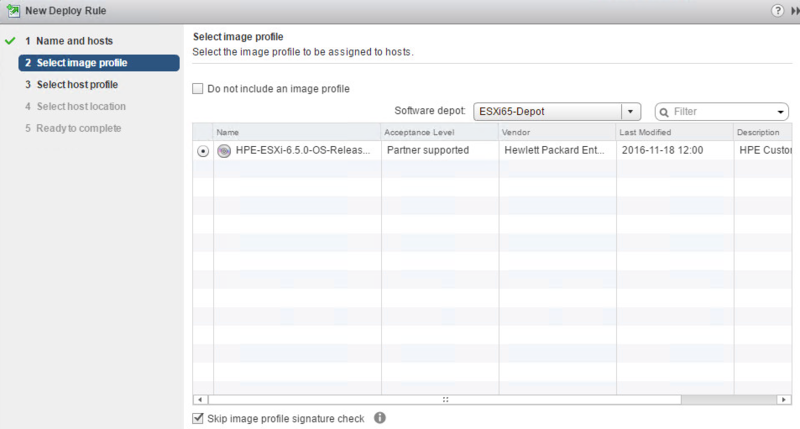 HTML5 Client – the new way of managing vSphere environment? Since vSphere 6.5, VMware killed standard Windows vSphere Client. However, it was promised so we should not be suprised (anyway I am still shocked ;)). Fortunatelly, every cloud has a silver lining. I reckon that VMware is aware that the current Web Client is not a perfect solution. That’s why they released completely new HTML5 vSphere Client which seems to be quite useful, intuitive and what’s the most important – it works as it should in therms of response times. Some of Administrators claims it reminds the old GSX console. The darker side of the new Client is that it’s constrained in terms of functionality and it will not let you perform all of the administrative tasks. 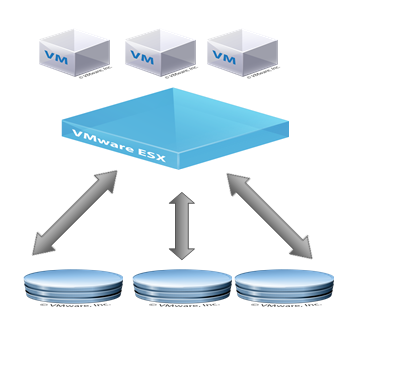 But do not worry it’s the first release and I hope VMware will expand the functionality quickly. The HTML5 Client could be accessed by energing the FQDN or IP address of our vCenter in the Web browser, then you will see two possible options – classic Web Client and the new one. You will also notice that there is a caution saying that it has only partial functionality. The list of non supported functionalities you will find here. After you sign in to the new administration interface you will see quite grey and simple but in my opinion still good looking interface. To sum up, it would be a handy tool in the future, it just need to be completed in terms of functionality. Unfortunatelly, for those who want to migrate to vSphere 6.5 there will be still a need to use Web Client. In this article I will try to review all new network features. Each VMKERNEL port can have its own Gateway. 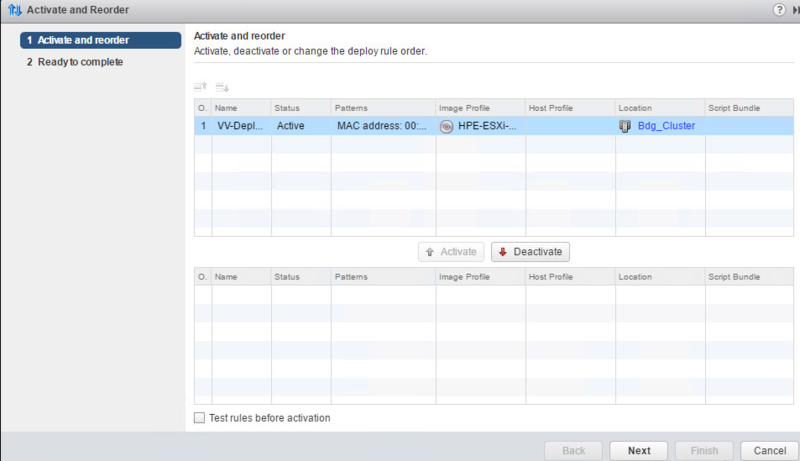 This will make it easy for vSphere features to function seamlessly. This eliminates the need for adding and maintaining static routes. Before vSphere 6.5 there was only one default gateway allowed for all VMKernel ports in an ESXi host. 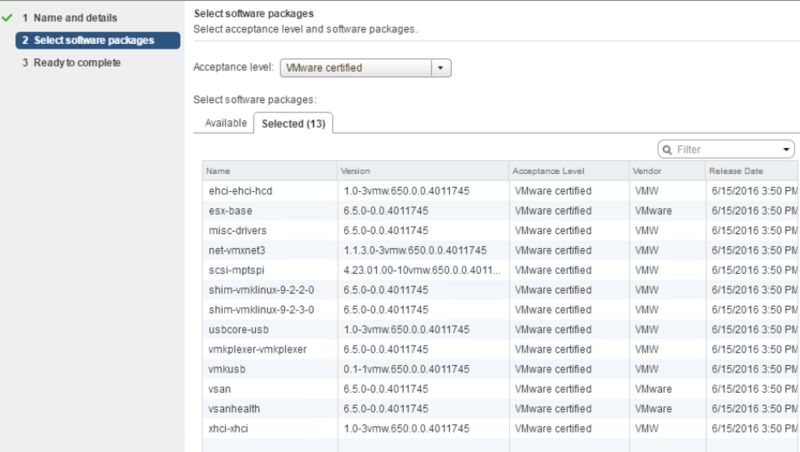 vSphere features such as DRS , iSCSI, vMotion, etc. leverage that use VMKERNEL ports are constrained by this limitation. Many of the VMKERNEL ports were not routable without the use of static routes unless they belonged to a subnet other than the one with the default gateway. These static routes had to be manually created and were hard to maintain. vSphere 6.5 provides the capability to have separate default Gateways for every VMKernel port. This simplifies management of VMKernel ports and eliminates the need for static routes. 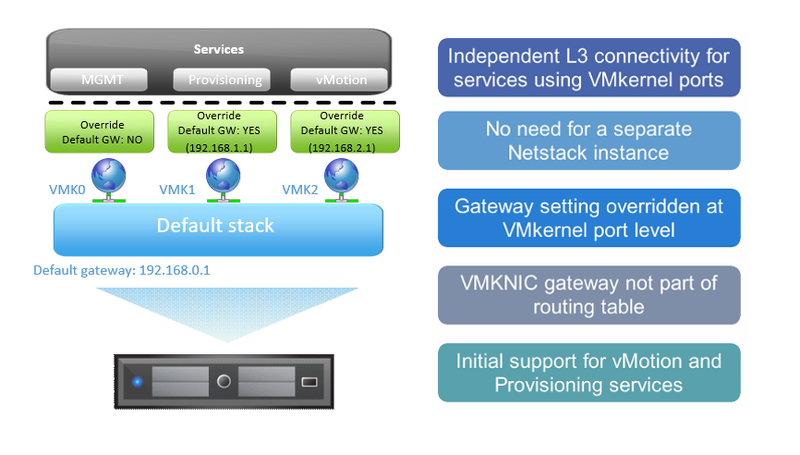 Prior to vSphere 6.5, VMware services like DRS, iSCSI, vMotion & provisioning leverage a single gateway. This has been an impediment as one needed to add static routes on all hosts to get around the problem. Managing these routes could be cumbersome process and not scalable. vSphere 6.5 provides capabilities, where different services use different default gateways. It will make it easy for end users to consume these feature without the need to add static routes. vSphere 6.5 completely eliminates the need for static routes for all VMKernel based services making it simpler and more scalable. 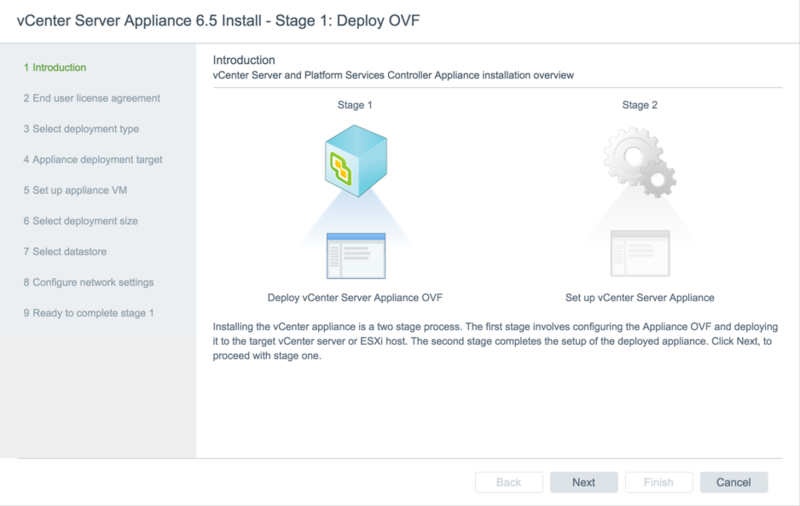 VM provisioning workflow prior to vSphere 6.5, for SR-IOV devices required the user to manually assign the SR-IOV NIC. This resulted in VM provisioning operations being inflexible and not amenable to automation at scale. 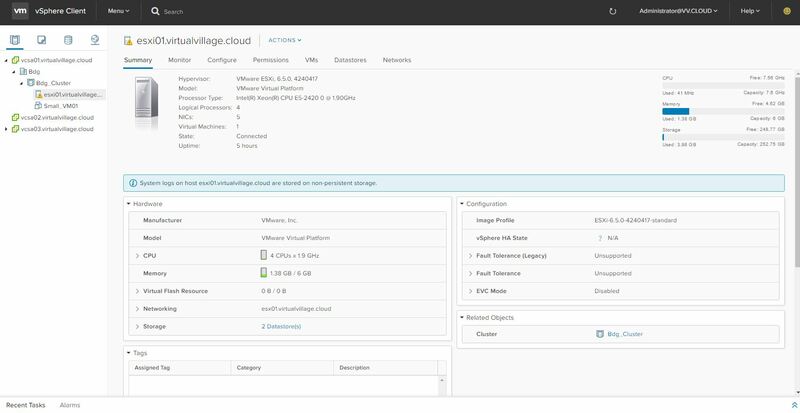 In vSphere 6.5 SR-IOV devices can be added to virtual machines like any other device making it easier to manage and automate. vSphere 6.5 has data path improvements to handle heavy load. In order to process large numbers of packets, CPU needs to be performing optimally, in 6.5 ESXi hosts leverage CPU resources in order to maximize the packet rate of VMs. Where are the improvements being made ? 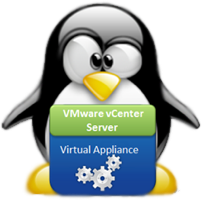 In vSphere 6.5 new feature to backup vCenter Server Appliance is available. 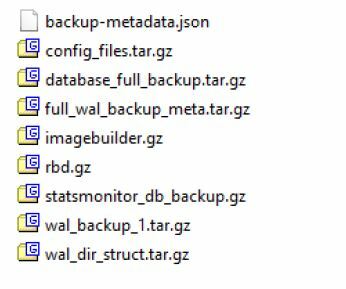 You can back up it by using build-in file-based solution which backup the core configuration and inventory into a few files. You can also decide which historical data you want to include in such backup. The backup is available from VAMI interface ( at port 5480). As I mentioned before you can choose if you want to backup the historical data aswell or not. The common part ( inventory and configuration) is always checked by default. In case you are forced to use your backup you have to use the vCSA ISO file downloadable from VMware site and then select the Restore option. The process is quite similar to normal deployment (2 stages in the process). NFS 4.1 is been supported since vSphere 6.0 and but now we are looking into providing stronger security. In vSphere 6.5 we have better security by providing strong cryptographic algorithms with Kerberos (AES). Also, IPV6 is supported but not with Kerberos and that is another area we are looking into along with supporting integrity checks. Better security for customer environments . In vSphere 6.5 VMware doubled the current limits and continuously work on reaching new scale around this . Current limits (before 6.5) pose challenge as for example in some cases our customers have 8 paths to a LUN, in this configuration one can have max of 128 LUNs in a cluster. Also, many of the customers tend to have smaller size LUNs to segregate important data for easy backup and restore. This approach can also exhaust current LUN and Path limits. Large LUN limits enable to have larger cluster sizes and hence reducing management over head. Support 512 LUNs and 2K paths in vSphere 6.5 .